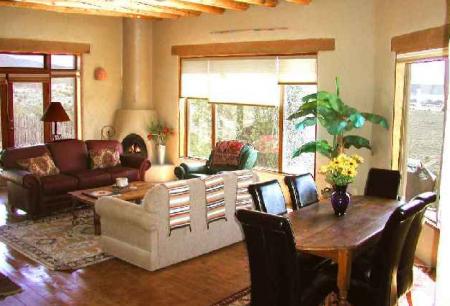 Welcome to Tres Lomas one of Taos Premiere Properties' very special vacation rentals located in Taos, NM. 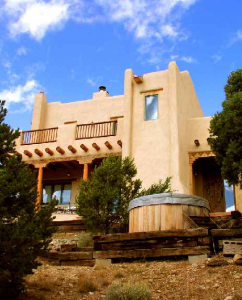 Million dollar views just seven miles from town, Tres Lomas features 270 degree views of the Wheeler Peaks, Taos Mountain, the Rio Grande Gorge and the distant Jemez Mountains to the west. 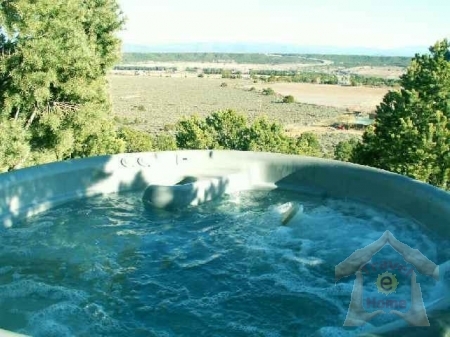 Complementing the spectacular scenery is a sense of solitude, seclusion and complete privacy. 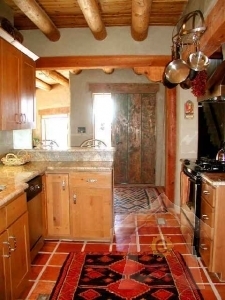 Back on the rental market following dramatic renovation, the expansion was designed by a revered and longest standing architect in Taos and this former one bedroom/one bathroom casita is now an expansive three bedroom / three bathroom home. The floor plan is unique in its' flexibility and can be rented as a 1, 2 or 3 bedroom home. The luxury master suite, at over 750 square feet on the 2nd level, features beautiful diamond finish plaster walls, 11-foot viga ceilings, striking dark hardwood floors and a kiva fireplace. The bathroom suite is finished in rare travertine and granite and features a large glass shower and separate soaking tub. 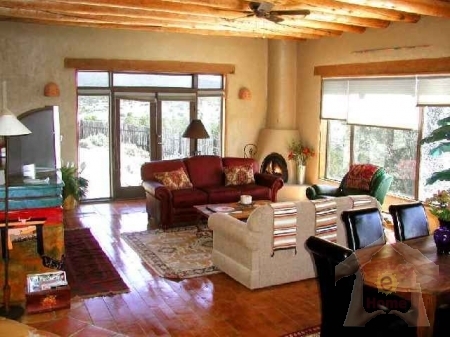 French doors open to a balcony overlooking the Rio Hondo and Rio Grande rivers. Located on the main level are two generous sized bedrooms with Queen beds. All bedrooms have Direct TV with DVD or VCR. The well appointed kitchen boasts new custom cabinetry, high-end stainless appliances and granite countertops. 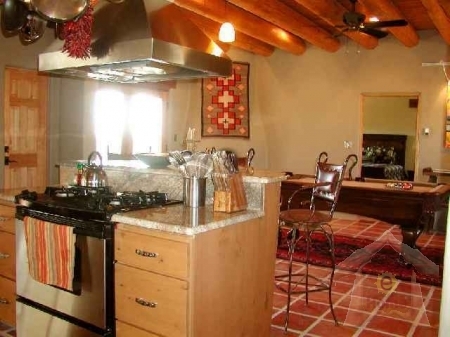 There is ample countertop bar seating in addition to the dining table which seats six. 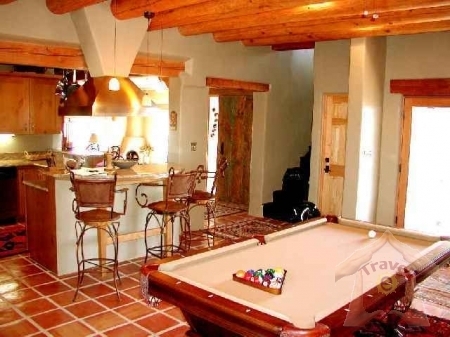 Adjacent to the kitchen is a cozy family room complete with kiva fireplace and a billiards table. 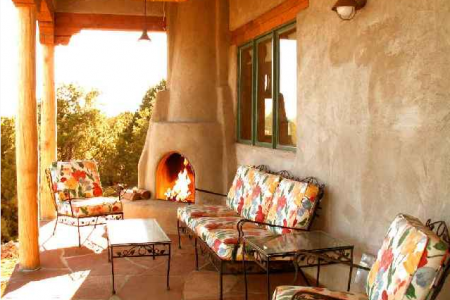 French doors lead to a covered portal with its' own outdoor kiva fireplace and ceiling fan for summer comfort. The living room/media room has a huge entertainment center complete with 56" wide flat screen TV, stereo/DVD/CD system. Wireless Internet completes the high tech amenities. The new addition with pool table room and kitchen are fully air conditioned. The cool conditioned air does filter down into the sunken living room but is not directly forced in. 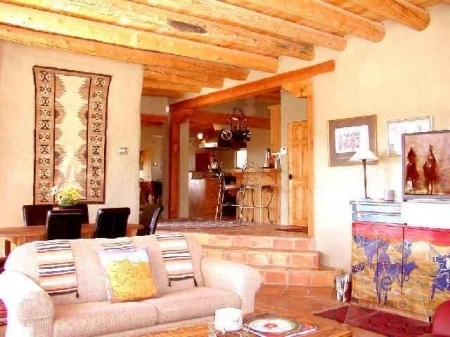 This very popular Taos lodging option is offered by Premiere Properties as one of our "unique Taos vacation rentals" because of its' million dollar views, extraordinary private setting, upscale architecture / decor and a bathroom and Television for every bedroom. This is a home that can be rented with multi bedroom combinations but is rented to only one group at a time with unused bedrooms & bathrooms being locked off.